A federal law that requires state driver’s licenses and photo ID cards to meet more stringent security standards will go into effect on October 1, 2020. After that date, standard driver’s licenses and photo ID cards will no longer be accepted for entry into federal buildings or to board a commercial aircraft; customers who wish to use their photo ID for these purposes must apply for a special new license or photo identification card that complies with federal REAL ID standards. State residents who would like to obtain a REAL ID can pre-verify now online or by visiting any state Driver License Center. Customers will need to bring proof of identity (such as an original birth certificate or a valid U.S. Passport), a Social Security card (unlaminated), proof of all legal name changes (such as a marriage certificate) and two proofs of current physical address in Pennsylvania (such as a bank statement or utility bill). REAL ID is optional for state residents. More details about REAL ID and the pre-verification process are available here. The 22nd annual Lancaster County 50 Plus Expo offers a wealth of information and resources for older Pennsylvanians. I look forward to joining some of my fellow elected officials and other exhibitors and vendors to provide information to seniors during this important event. The expo will be held on September 19 from 9 a.m. until 2 p.m. at Spooky Nook Sports, located at 2913 Spooky Nook Road in Manheim. More information on the event is available here. I hope to see you there! 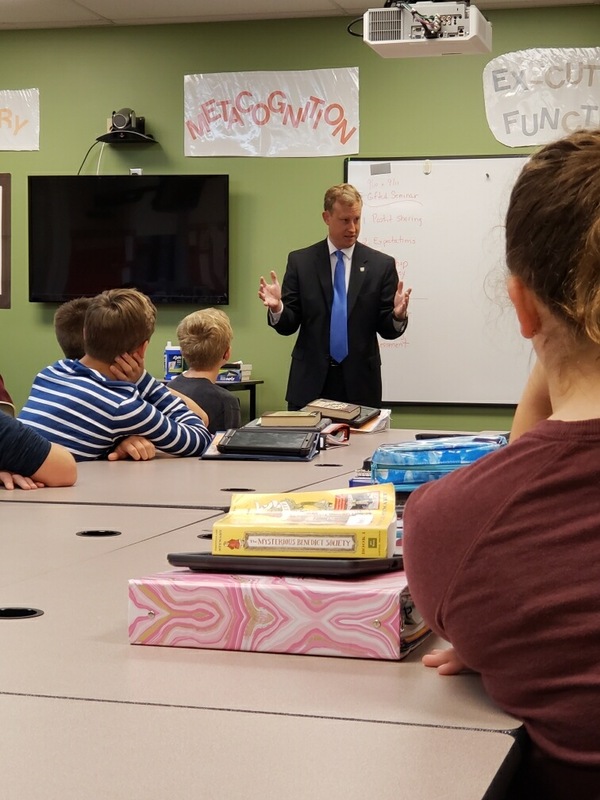 I appreciated the chance to visit with 7th and 8th grade students from Centerville Middle School to discuss the legislative process and the role of a state Senator. September is designated as National Preparedness Month to encourage all citizens to prepare for natural disasters and other emergencies. The Pennsylvania Emergency Management Agency is urging state residents to participate in the “30 Days, 30 Ways” challenge to be better prepared for the unexpected. The awareness campaign urges individuals to do one small thing every day in September to prepare for an emergency, such as discussing emergency plans with family members, collecting everyday items that might be useful in a crisis, or ensuring your pets’ needs can be met during a disaster. More information on creating an emergency kit, preparing family emergency plans and other steps to help prepare for the worst is available online at www.ready.pa.gov. Consumers can apply now for rebates of up to $2,000 for the purchase of a new plug-in hybrid, plug-in electric, natural gas, propane or hydrogen fuel cell vehicle through the state’s Alternative Fuels Incentive Grant (AFIG) Program. Rebate amounts vary based on the type of alternative fuel vehicle purchased. Rebates of up to $750 are available for pre-owned alternative fuel vehicles with 75,000 miles or less. Additional rebates of $500 are available for consumers who qualify for the program and also meet certain income requirements. More details about the AFIG program, including applications, are available online here.